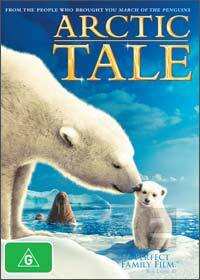 From the creators of the critically acclaimed March of the Penguins, comes Arctic Tale, a joint venture with Paramount Vantage and National Geographic which follows the heart warming and sometimes dangerous tale of Seela, a Walrus pup and Nanu, a Polar bear cub from their birth to parent hood. Filmed by Adam Ravetch and Sarah Robertson, this married couple spent six years in the harsh climates of the Arctic wastelands as they captured some of the most remarkable footage of Arctic animals to be ever taken. Queen Latifah provides the in-depth and sometimes anecdotal narrative as the viewer follows these two distinct animals and the difficult challenges that they face. This documentary has been made with children at mind and contains some truly hilarious moments in the film which also displays their human-like emotions and match that with modern music hits like "Celebrate" and "We are Family" and this is really a family documentary, especially the montage of a Walrus heard releasing wind. It had us all in stitches! The documentary successfully captures the harsh life of these creatures and how man's impact on the environment is threatening these animal's food chains that makes this a truly inspirational documentary. The footage of Arctic Tale is truly amazing and is presented in 16:9 widescreen with Dolby Digital 5.1 that captures all the sights and sounds of this winter wonderland. Best of all, the packaging is bio-degradable, now if only more DVD distributors followed this method, the planet would be a little bit better off which is what the creators are trying to assist the viewer to achieve. Lastly, Arctic Tale contains some interesting extras that include the "Making of Arctic Tale and the entertaining "Are we There Yet" World Adventure: Polar Bear Spotting" that kids will thoroughly enjoy and will make them want to spot polar bears. A first class presentation from start to finish. "Are We There Yet? World Adventure: Polar Bear Spotting"